I better put up the bloomers you guys made from last time! 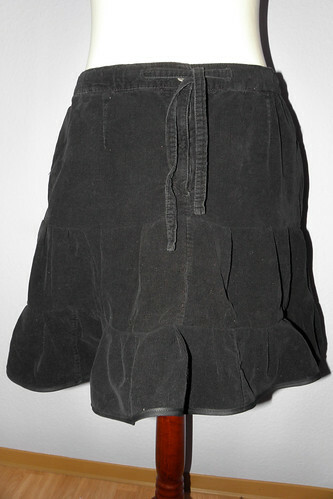 Stacey from Secret Life made these adorable black bloomers with spotty bows and buttons! Now onto the Rock n Roll Ruffle Skirt! Using Thera's tutorial, we whipped up quite a few of these! Here's mine. I changed it up a bit, but I followed her tute regardless, turning a pair of pyjama pants into this cute ruffley skirt! Thera's friend Nicki made a pair also! She used grey blue and black tweed pants for hers. ADORABLE. Thera repurposed some black denim pants into this skirt! I really dig the simplicity! She also made a few more! Check 'em out. Trisha turned a pair of her favourite pants into this rad skirt! Love the hem. And Stacey made this rock n roll ruffle skirt! I love the plain ones, so much easier to co-ordinate into your wardrobe.